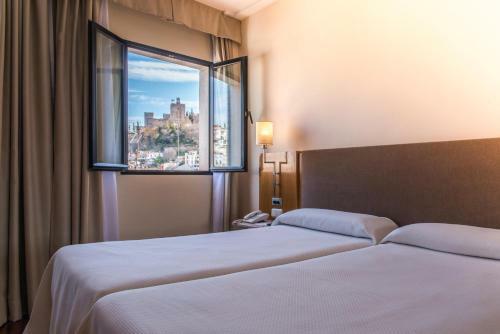 Located in Centro, the NH Inglaterra is close to Granada Cathedral and offers air conditioning, an express check-in and check-out feature and free Wi-Fi. The NH Inglaterra provides many facilities including 24 hour room service, a hair salon and a coffee bar. Welcoming and professional staff are available 24 hours a day. Travel arrangements can be made at the hotel's tour desk. The comfortable and contemporary rooms at the NH Inglaterra have a mini bar, cable / satellite channels and a private bathroom. Complimentary toiletries, in-room movies and a hair dryer can be found in each room of the hotel. To ensure your day gets off to a good start, the hotel provides a buffet breakfast each morning. Guests can relax in the English-style pub, offering a pleasant setting for an after-dinner drink. The hotel is a short walk from the Archaeological Museum of Granada, and about a 20-minute car ride from Monachil. The hotel is within two minutes walk from Royal Chapel of Granada and the Madrasah of Granada, while the Monastery of Saint Jerome is a 10-minute walk away. This hotel is 1248 metres from the Alhambra entrance, 143 metres from Plaza Nueva (the absolute centre of Granada), 1430 metres from the train station and 2882 metres from the bus station.